^ 22.00 22.01 22.02 22.03 22.04 22.05 22.06 22.07 22.08 22.09 22.10 22.11 German Daggers Info. [2011-05-14]. （原始内容存档于2016-03-04）. 互联网档案馆的存檔，存档日期2012-02-04. ^ Levine, Alan J. D-Day to Berlin: The Northwest Europe Campaign, 1944–45. Stackpole Books. 2007: 14, 15. ISBN 978-1-4617-5085-7 （英语）. ^ Mitcham, Jr., Samuel W. The Desert Fox in Normandy: Rommel's Defense of Fortress Europe. Stackpole Books. 2007: 233. ISBN 978-0-275-95484-0. ^ D. Krause, Michael D.; Phillips, R. Cody. Historical Perspectives of the Operational Art. Government Printing Office. 2006: 175–179. ISBN 978-0-16-072564-7. ^ Stroud, Rick. 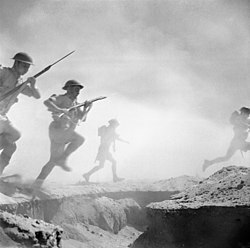 The Phantom Army of Alamein: The Men Who Hoodwinked Rommel. A&C Black. 2013: 33–34. ISBN 978-1-4088-3128-1. ^ Murray, Williamson; MacGregor, Knox. The Dynamics of Military Revolution, 1300-2050. Cambridge University Press. 2001: 172-173. ISBN 9780521800792. ^ Gross, Gerhard P. The Myth and Reality of German Warfare: Operational Thinking from Moltke the Elder to Heusinger. University Press of Kentucky. 2016: 216. ISBN 9780813168395. ^ No. 38196. London Gazette (Supplement). 1948年2月3日: 843 [2008年7月30日]. ^ Schwarzkopf, Norman; Pyle, Richard. Schwarzkopf: the man, the mission, the triumph. Signet. 1991-04-22: 113. ^ Blais, Jan David. Twentieth Century Limited: Book Two, Age of Reckoning. ^ 517.0 517.1 Storbeck, Siegfried F. Erwin Rommel – Bitte mehr Sachlichkeit! [Erwin-Rommel - Please more objectivity!]. Bundeswehr - IF Zeitschrift für Innere Führung. 2013-12-04 [2016-09-12]. ^ Sadkovich, James J.; Hixson, Walter L. Of Myths and Men: Rommel and the Italians in North Africa, 1940-1942 (chapter) - The American Experience in World War II: The United States in the European theater. Taylor & Francis. 2003: 238–267. ISBN 9780415940337. ^ Knorr Jr., Major Marvin. he Development Of German Doctrine And Command And Control And Its Application To Supporting Arms, 1832–1945. Pickle Partners Publishing. 2015: 79. ISBN 978-1-78625-062-9. ^ Knox, MacGregor. Hitler's Italian Allies: Royal Armed Forces, Fascist Regime, and the War of 1940–1943. Cambridge University Press. Oct 30, 2000: 2, 3, 10, 29, 116, 118. ISBN 978-1-139-43203-0. ^ Stockings, Craig. Bardia: Myth, Reality and the Heirs of Anzac. UNSW Press. 2009: 405. ISBN 9781921410253. ^ Chant, Christopher. Warfare and the Third Reich: The Rise and Fall of Hitler's Armed Forces. Pavilion Books. 2015: 51. ISBN 9781849943185. ^ Terry, Captain T. Jordan. Leader Presence in Future Warfare. The Army Press. [2016-09-03]. （原始内容存档于2016年9月7日）. ^ Stewart, Bob. Leadership Under Pressure: Tactics from the Front Line. Kogan Page Publishers. 2009: 90. ISBN 9780749458553. ^ Dear, Ian. The Oxford guide to World War II. Oxford University Press. 1995-01-01: 7. ISBN 9780195340969. （英文） Caddick-Adams, Peter. Monty and Rommel: Parallel Lives. New York, NY: The Overlook Press. 2012. ISBN 9781590207253. （英文） Butler, Daniel Allen. 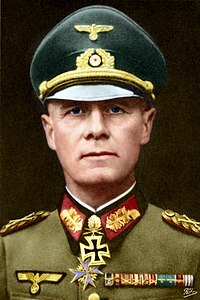 Field Marshal: The Life and Death of Erwin Rommel. Havertown, PA / Oxford: Casemate. 2015. ISBN 978-1-61200-297-2. （英文） Bennett, David. A Magnificent Disaster: The Failure of Market Garden, the Arnhem Operation, September 1944. Casemate Publishers. 2011. ISBN 9781935149972. （英文） Hansen, Randall. Disobeying Hitler: German Resistance After Valkyrie. ISBN 9780199927920. （英文） Mitcham, Jr., Samuel W. Retreat to the Reich. Stackpole Books. 2006. （英文） Mitcham, Samuel W. Rommel's Desert Commanders — The Men Who Served the Desert Fox, North Africa, 1941–42. Mechanicsburg, PA: Stackpole Books. 2007. ISBN 0-8117-3510-9. （英文） Watson, Bruce Allen. Exit Rommel: The Tunisian Campaign, 1942–43. Westport, Conn.: Praeger Publishers. 1999. ISBN 9780275959234. （英文） Forczyk, Robert. Sevastopol 1942: Von Manstein's triumph. Osprey Publishing. 2008: 22. ISBN 978-1-84603-221-9. （德文） Remy, Maurice Philip. Mythos Rommel. Munich: List Verlag. 2002. ISBN 3-471-78572-8. （英文） ——. Rommel and His Art of War. Greenhill Books. 2003. ISBN 9-78185367543-0. （英文） ——. Rommel and His Art of War. Amber Books Ltd. 2014. ISBN 9781782741909. （英文） Murray, Williamson; Millett, Allan Reed. A War To Be Won: fighting the Second World War. Harvard University Press. 2009. ISBN 978-067404130-1. （英文） Citino, Robert. Death of the Wehrmacht: The German Campaigns of 1942. University Press of Kansas. 2007. （原始内容存档于2016-10-06）. （德文） Von Fleischhauer, Jan; Friedmann, Jan. Die Kraft des Bösen. Der Spiegel (44). 2012 [2016-08-03] （德语）. （英文） Newton, Steven H. Kursk: The German View. Cambridge, MA: Da Capo. 2002. ISBN 978-0-306-81150-0. Brighton, Terry. Patton, Montgomery, Rommel: Masters of War. 2008: 247. ISBN 978-1-4001-1497-9. Lieb, Peter (2013). "Ardenne Abbey Massacre". In Mikaberidze, Alexander. Atrocities, Massacres, and War Crimes: An Encyclopedia. Santa Barbara, Calif: ABC-CLIO. pp. 25–27. ISBN 1-59884-926-3. Pimlott, John, ed. (1994). Rommel: In His Own Words. London: Greenhill Books. ISBN 978-1-85367-185-2.